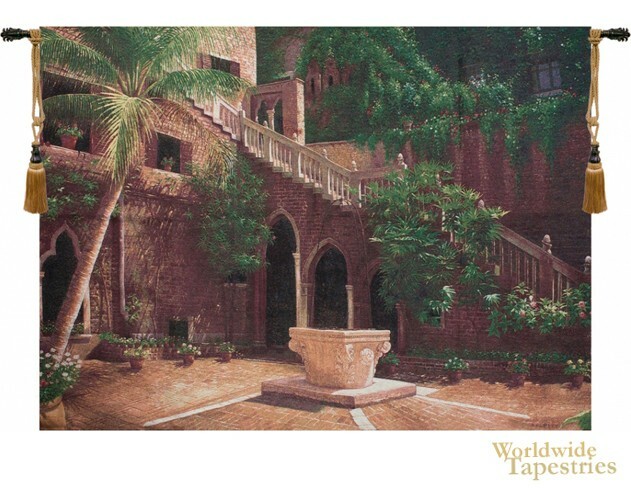 This tapestry “Wishing Well Courtyard” shows an elaborate courtyard with exotic design elements, with the light bathing an ornate wishing well in the centre. Lush palms and tropical plants decorate the courtyard, including a long stairway from the top levels down to the base of the courtyard. The use of light is beautiful here as the light illuminates the scene to show the colors and textures in this piece very well. This tapestry “Wishing Well Courtyard” is lined and has a tunnel for easy hanging. Note: tapestry rods and tassels, where pictured, are not included in the price.